Method:Wash well and soak urad daal,channa or tur daal,in one bowl.Soak rice and methi seeds in another bowl.After 6 hours of soaking,wet grind the daals along with rice in to a paste.Add salt.Let it ferment for 6 to 8 hours.Store in fridge. 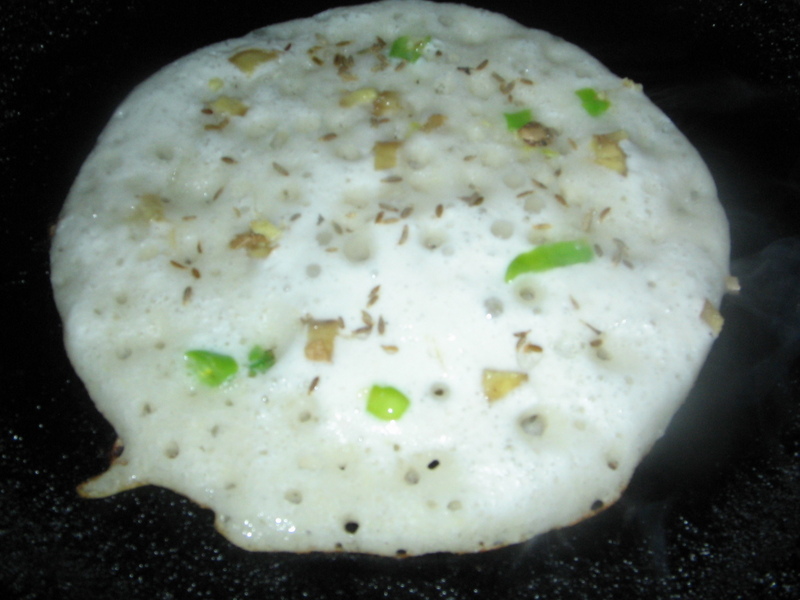 When u are preparing uthappams,Place tawa on the stove,after the tawa is heated add 2 tsp of oil and add 2 cups of flour.Do not spread the batter.It should be thick in size.Sprinkle jeera,ginger and green chilli slits.add 1 to 2 tsp oil.Let the flame be in medium heat,after it is done,turn back side,add another half tsp oil,and remove from tawa after 2 to 3 min. Adjust the flame from low to med or med to low according to your expertisation in making dosa.Serve with chutney or tomato sauce.Or if u dont have chutney also,woh bina chutney bhi chalega,because of ginger and green chilli pieces. 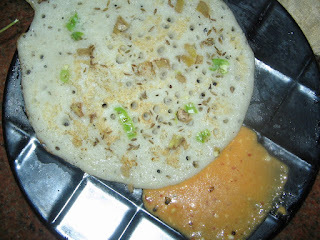 This is a item i used to eat weekly 3 times before going to college,which my mom learnt from our neighbours Tamilian Mami in the time of my education..
would love this delicious version of uttappam!